The staghorn sern is an epiphyte, which means it gets most of it nutrients from the air. It clings to trees and other surfaces using brown basal fronds. Because of its unusual growth habit, it can be mounted in a wire basket or mounted on boards that are attached to trees or structures. 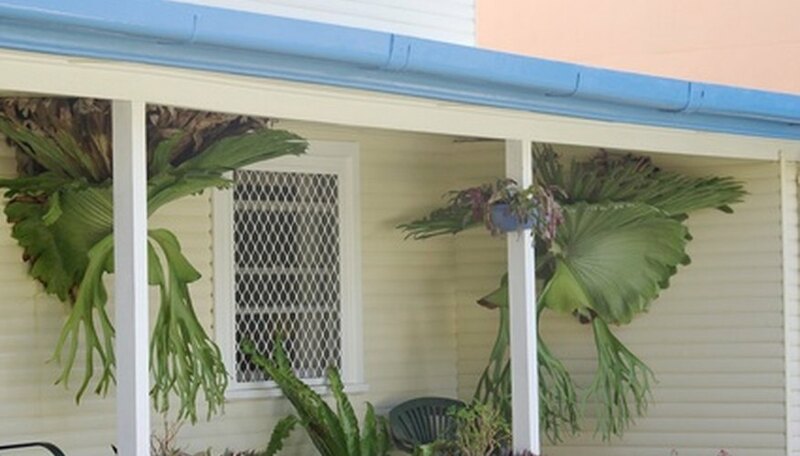 Another way to mount a staghorn fern is to attach it to a board and hang it from a tree using a chain. You'll need a chain because of its eventual mature weight. This is a common method in climates with freezing temperatures in the winter, as it makes it easy to move the ferns to a protected spot. Place a 12-inch piece of untreated 2-by-4 wood flat on a table or workspace. The wood must be untreated because treated wood often contains copper, which kills staghorn ferns. Use a pencil to mark the wood where the base of the fern will cover. Nail six 2-inch nails into the wood, 1 inch from each side of where the fern will be mounted, leaving about 1/2 inch of nail exposed to wrap the fishing line around. The fern will be mounted on the top side of the 2-by-4 piece of wood when it is hung. Drill two holes into the piece of 2-by-4 inch wood, 3 inches from each end, toward the middle of the wood. Drill the holes large enough for each hole to hold one nut eye bolt. Insert a nut eye bolt in each hole and place a washer over the threads protruding from the bottom of the wood. Tighten the nuts over the bolts to secure the washers and nut eye bolts. Soak a few handfuls of sphagnum moss in a bucket of water until it is saturated. The amount of moss should be enough to fill the cup-shaped backside of the staghorn fern as it is mounted on the wood. Place the saturated sphagnum moss on the wood in the center of the nails and mount the staghorn fern over the moss by wrapping the fishing line around each nail and crossing over the base of the fern. Wrap firmly, but not so tightly it cuts into the fern's base. Tie off the fishing line when the fern is firmly mounted on the board and cut off excess line with a pair of scissors. After a few months, the fern will grow over the line and will eventually cover the entire piece of wood. Take each end of the chain and attach to the eye bolts with the appropriate sized chain shackle. Hang the fern in the desired location, which should be a warm, shady area where you can water it if it gets dry. If you need to move the fern to another location, simply remove one chain shackle and the chain will break free of the mount.